I don't generally read adult books so this one was recommended to me when I fancied a change and I must say I was hooked pretty much from the first page. 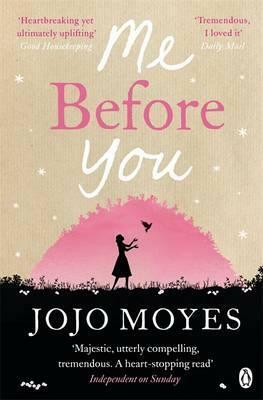 Me before you is the story of Will and Lou. The pair meet after Lou is employed to work with Will as a carer during the day to help feed me, do odd jobs and keep him company. Will was in an accident two years previously which left him unable to use his legs or arms. Their relationship is an interesting one and starts off badly but over time it evolves and changes into something really sweet and utterly fascinating. 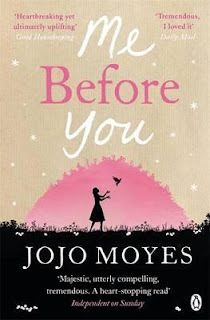 Louisa is a brilliant character and as much as anything I loved her story because throughout this book she really starts to find herself and think about the person she wants to be rather than the person she has been all her life. I loved that through her interactions with Will she is forced to reevaluate her current life and what she has done with it and throughout the book you really see her come out of herself and grown with confidence. Another thing I thought was good about this book was the way it made me think about people with disabilities like Will. Even the most basic of task which we take for granted was too difficult for him to manage. I also thought a lot about the way he was treated by outsiders who didn't understand his condition and, with all good intentions, often did things that Will didn't want or were patronising. For this end I would have actually liked a chapter from his point of view to get into his head a bit more as the story did flick to other characters but not him. You realise very early on that this was never going to be a happy book and the ending was never going to be a happy one but even so I don't think I had prepared myself enough for how the book finally ended in the really bittersweet way it did. A really interesting read which I was completely engrossed in.